Stock sell off on every battle front continues. Well not every battle front but this shout sounded appealing to me so I used it. Yesterday and a few days ago I was interested in Realty Income, which fell from its parabolic run to sky heights. So it was obvious that it would fall. Many stocks had similar run up pattern, for example PPL or JNJ to name a few. I am still very interested in adding more Realty Income shares to my portfolio, but my exposure to REITs industry is already too large and I need to look at other opportunities the market is now providing. I have a few stocks in my portfolio which are now getting lower such as AT&T (T), KMP, MCD, and NGLS. Right at this moment, the most appealing stock to me is Kinder Morgan Partnership. As of this writing it is down -2.18% and it broke thru 200 day MA (see the chart below). Look at the bumpy road on the right lower corner in the smaller window showing 5 yr chart. 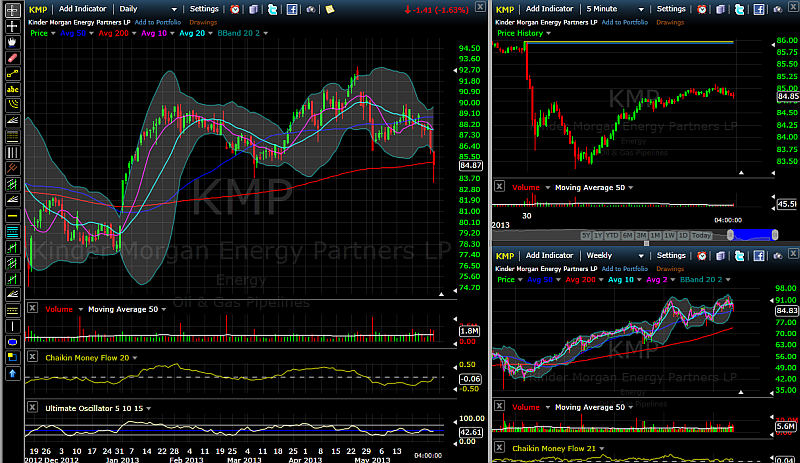 KMP was growing and every time it touched 200 day MA, it bounced and continued higher. If you pull a chart on Yahoo.com and select maximum time frame, this trend is even more apparent. Of course, this isn’t a guarantee, that KMP will behave this way in the future, but we can expect, that it will most likely do so. Although there is risk with this company (mainly regulatory and legislative risk), I think this is a good company and I am taking advantage of the recent price drop to add more shares to my current holdings. There are other great companies which suffered loses and broke thru 50 day MA which I would consider adding. Among those I mentioned above the hottest candidates would be addition of MCD and opening a new position in Coca Cola company. Kinder Morgan Energy Partners is a pipeline transportation and energy storage company. In May 2013, the company acquired the entire share capital of Copano Energy LLC. Its current dividend yield is 6.33%. I own Kinder Morgan through shares of KMI & have been watching this recent dip closely as an opportunity to add more shares. Agree, I am also ready to add more shares. I have KMP on my watch list. The dividend is quite nice. Now might be a good time to pick up a few shares. Thanks for the reminder. The stock is still falling. Since I am using trailing contingency order to buy, the order will not (most likely) execute today. But I am already in the process of loading a few more shares. I’m invested in Kinder and I want to add as well. I’m looking to add but to this companies other security KMR. KMP: partnership, issues cash dividend, K1 tax filing. KMR: llc, issues dividend in shares (same rate as KMP). No K1. KMI: taxable corp, issues qualified dividends. The return profile is the same for KMP versus KMR. KMP issues a K1 which is more complicated to handle on your tax return. In both cases, all or most of your dustributions are not immediately taxable. For me i’m going to buy KMR in my IRA (KMP is not recommended). For my taxable account I already own KMI. Sfi, thanks for the quick review. I already have a few K1s when doing taxes, so adding another one shouldn’t be a hurdle to me :). But i take your advice and when adding Kinder to my ROTH, I will go with KMR. I have KMP in my taxable account only so far. 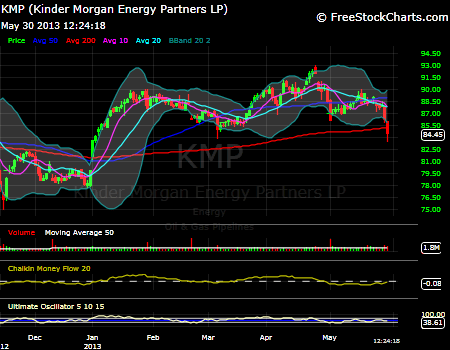 I somehow listen to Jim Cramer and KMP is one of his favorite stocks. I have some holding in it. I didn’t know that. I have heard a lot of people speaking against KMP, but I like the stock. Paying consistently nice dividends.